Frazier was a 20-year-old circus lion from Mexico who had seen better days. Almost toothless, his tongue lolled out of his mouth and his skin hung on his emaciated frame. 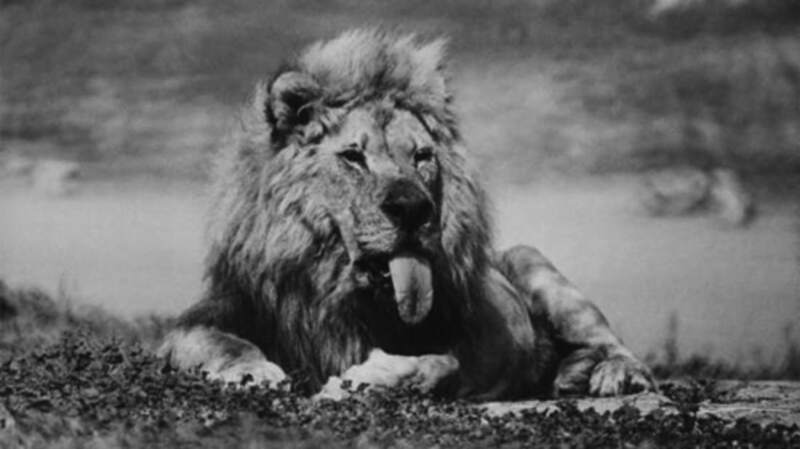 In 1970 he was donated to Lion Country Safari in California to live out his final days. To everyone’s surprise, Frazier was “adopted” by a pride of lionesses that until that time had rejected the attention of all the parks’ male lions. Not only did these attentive females bring Frazier his food and prop him up to walk (one lioness on each side of him), they tended to his other lionly needs. Frazier sired 30 cubs during his first year at the reserve, and continued to be just as prolific the rest of his life. He passed away in 1972 due to natural causes (if you count “exhaustion” among those causes). In the underwater world of the seahorse, it’s the male that gets to carry the eggs and birth the babies. And – get this - he actually competes with other males for the honor! They stage contests of brute strength (well, as strong as an inch-long creature can be) and engage in exhibitions of tail-pulling and wrestling to impress the female. He also fills up his egg pouch with water and then expels it as forcefully as he can, trying to prove his fitness and worthiness. Once the female selects a mate, she deposits her eggs in his pouch and leaves him to gestate for three weeks. During that time, the pregnant papa doesn’t venture far away from his nesting spot, and the only food he eats is whatever happens to float by. The female, meanwhile, is free to go off and gorge herself wherever she can find the best chow. Seahorses are monogamous, so Mama does return home each night to provide a bit of prenatal care (like “fanning” the eggs so they stay clean and get sufficient oxygen). When the male goes into labor, the contractions usually last 72 painful hours, during which time most of the color drains from him; he turns pasty white (and there is no starfish nearby coaching him to use his patterned breathing). After he finally expels the babies, this glutton for punishment shows off his pouch and begs the female to impregnate him once more. The Emperor Penguin is the largest penguin in the world - it grows up to three feet tall and lives in the frigid waters of the Antarctic. When the time comes to mate in May and June, the male penguins hop out of the water in large groups and head inland, marching in single file. They meet up with the females and proceed to engage in a traditional mating ritual. The female will then lay her egg (usually only one per penguin) and hand them off to the male. Papa places the egg on top of his feet, and covers it with a large layer of belly fat called the “brood flap.” Mama then takes off and forages for the next two to three months, while Papa penguin stands still and keeps the egg warm. As many as 1,000 penguins will huddle together in an area called a “rookery,” keeping each other warm, standing in the same spot while the temperature plunges to -80°F until the egg hatches. The male doesn’t eat anything during this time, and he usually loses up to half of his body weight by the time the chick is hatched. When the chicks do emerge, they’re hungry, so dad has to regurgitate what little he has left in his stomach to feed them. The mothers return shortly after the chicks are hatched and take over the feeding and nurturing chores. The fathers have become quite maternal by this point and are at first reluctant to part with their charges, but they soon realize that they’re starving and they hand off junior to mom so they can go and gorge themselves. Don’t tell their wild canine counterparts (like the wolf and coyote), but the red fox gets just as gooey over children as your average human father. When mama gives birth to her pups, she is unable to leave the den for several weeks, so papa fox brings her food every four to six hours. Once the pups are mobile, researchers have observed papa foxes delighting in romping and playing with their offspring. When the pups are about three months old, it’s time to teach them the various harsh realities of life, and their daddies are there to instruct them. About the time mom stops nursing, dad will bring food close to the den and cover it with twigs or leaves and teach their offspring how to forage. As the pups grow older and learn to find food on their own, papa ups the tutelage and starts pouncing on them as they dine to teach them the danger of predators. Native to South America, rheas are large, flightless, long-necked birds that somewhat resemble the ostrich. Male rheas are polyamorous – that is, they have too much love within them to be confined to just one female. But unlike human men who use that excuse when they’re invited by Maury Povich to undergo multiple DNA tests, rhea males take very serious responsibility for their excessive breeding. After mating, they get to work building a nest for the combined 10 to 60 eggs their various baby mamas will lay. Not every egg will hatch, because Papa sacrifices a few for use as decoys – he moves them outside of the nest to satisfy any predators and keep them from approaching closer. The male also incubates the eggs, and once they hatch they’re strictly Daddy’s chicks until they’re six months old. The male protects them very aggressively, calls them back when they wander too far afield, and lets them nestle under his feathers during nap time.